A Notice to Pay Rent is a legal notice sent by a Landlord to a Tenant when the tenant has failed to pay the full rent due in a timely manner. 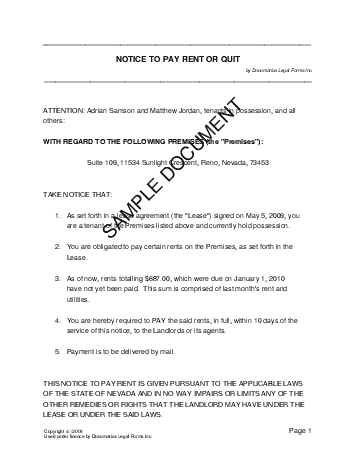 The notice outlines how much rent is due, when it is due, and the method of payment. If the tenant ignores the notice the landlord may further pursue the issue with a Demand for Compliance Letter or similar form, or terminate the lease. Breakdown of the rent could be something like: $300.00 for May 2019, plus $214.00 for appliance repair in June 2019. Do you wish to specify the method of payment? Do you want to state the payment address in the notice? We strongly recommend obtaining an attorney reviewed Notice to Pay Rent directly from us. Below are some random samples we have created with Documatica. Please note that these documents reflect a certain set of answers, and it is very likely that the document you require is different. Do not rely on the templates below - create your own customized Notice to Pay Rent with our webpage. For maximum legal protection, obtain a lawyer reviewed Notice to Pay Rent directly from us.